We are offering the best quality of Motor Cover that protect your motor from sun and moisture exposure. 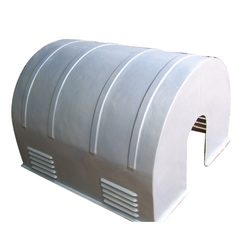 These are tested on various quality parameters and can also be customized as per the requirements of clients. Our range of F.R.P. Motor Cover are anti corrosive, life long, water proof, light weight, and no maintenance charges. Our range of F.R.P. Motor Cover are anti Corrosive, Life Long, Water Proof, Light Weight, No Maintenance Charges, Not to be paint (built in paint), Attractive Appearance, Air Ventilation for Motor Cooling, Once piece construction.